Local people on Skye are being invited to become voluntary wardens to help safeguard vulnerable fossil localities in a bid to tackle the problem of reckless collecting. It is literally a giant step for mankind – or at least for its understanding of giant animals that once roamed what is now Scotland. 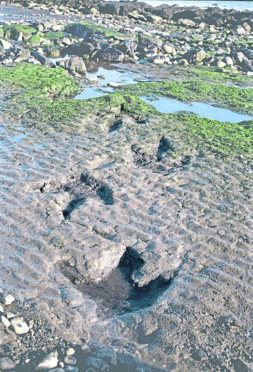 The first evidence that dinosaurs walked on the Scottish mainland has been found, with the discovery of a remarkable collection of 170 million-year-old footprints near Inverness. The globally-important find includes a raised footprint left by a member of the sauropod family, the largest animals ever to have lived on land. The print, perfectly preserved in sandstone, is about 70cm long and clearly shows a foot, heel and four toes. Until now, the only evidence of dinosaurs in Scotland existed on the Hebridean island of Skye. Dr Neil Clark, vice-president of the Geological Society of Glasgow, had been mystified why no evidence of dinosaur activity in other parts of the country had turned up. He resolved the matter earlier this year when he found footprints preserved in rocks at a coastal location close to Inverness. “I have frequently bemoaned the fact that dinosaurs have not been found elsewhere in Scotland but I now have discovered some new dinosaur footprints in a completely different location,” said Dr Clark. Dr Clark, who is also the curator of palaeontology at the Hunterian museum in Glasgow, said the location was being kept secret until research has been carried out on the “very important” remains. “They are from a completely new part of Scotland for dinosaurs and will add significantly to our understanding of dinosaurs of that age in Britain,” he added. The discovery is likely to elevate Scotland as one of the world’s top dinosaur fossil hotspots for the Middle Jurassic, a period that lasted from about 174 million to 163 million years ago. Globally, few fossil sites from the era exist. The Inverness site contains fossilised impressions of footprints that are thought to be from several different types of dinosaur. The size of raised footprints suggest they were left by a member of the sauropod family of dinosaurs – huge, four-legged herbivores with long, slender necks that stood up to 18 metres (60ft) high. Now Dr Clark has launched a crowdfunding campaign to raise the £5,000 needed to search and map dinosaur footprints across Scotland, with the money likely to be used to buy a drone. Researchers from Edinburgh University are expected to take part in the project, which could unseat Skye as Scotland’s dinosaur hotspot. About 170 million years ago, shortly after the supercontinent Pangaea began to break up, the land that is now Skye was part of a smaller subtropical island. It is often referred to as the Jurassic Isle of Scotland, due to its fossilised deposits of herbivorous and carnivorous dinosaurs. Dr Clark made his mainalnd discovery after attending a conference in Inverness in March. He decided to walk along the coast and noticed dinosaur footprints on the shoreline. “I was pretty excited. I knew the significance of the find straight away,” he said. The crowdfunder is at justgiving.com/crowdfunding/scottish-dinosaurs.